The Maker Movement is rapidly growing at educational institutions around the world and across age and employment levels, from kindergarten to mid- and late-career. “Making” offers complementary learning environments to the traditional classroom and helps participants develop skills that differ from those developed in traditional student projects and learn-by-doing classes. The spaces housing these activities are called makerspaces, also sometimes referred to as hackerspaces, hacker labs or fab labs. Broadly, they are all interdisciplinary, participatory, peer-supported learning environments where people can design and invent among a community of other makers. 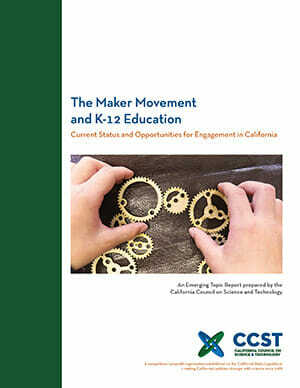 In line with the “Doing What MATTERS for Jobs and the Economy” (DWM) framework, the California Community College Chancellor’s Office (CCCCO) is interested in growing a statewide network of makerspaces linked to California Community Colleges (CCs) as a key partner in developing a workforce for the innovation economy. At the CCCCO’s request, CCST was commissioned to develop a report to inform these efforts. This report was released in April 2016. 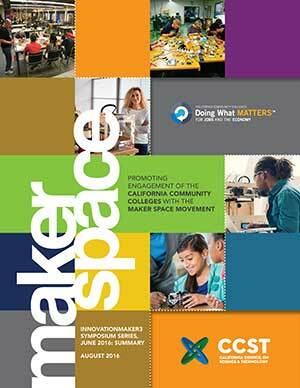 Following the release of the initial report, CCST and the CCCCO ran an InnovationMaker3 Symposium Series. 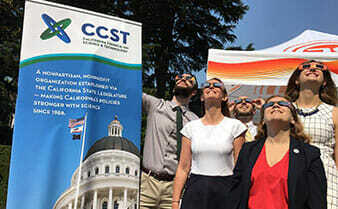 The symposia, held in June 2016 in Berkeley, Bakersfield, and San Diego, were designed to bring together interested community college Career Technical Education and Science, Technology, Engineering, Art, and Math faculty and staff with experts from their regional Maker communities. 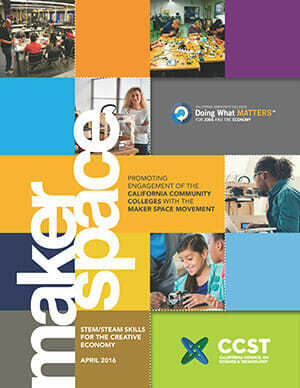 The goals of the meetings were to begin building the envisioned community college makerspace network and to inform administration and faculty of considerations required to develop a successful makerspace. The three symposia were attended by over 100 participants representing 38 colleges in total. This summary report provides an overview of the symposia. The Maker Movement is rapidly growing at educational institutions around the world and across age and employment levels, from kindergarten to mid- and late-career. This paper includes proceedings, interviews, and photos from the InnovationMaker3 Symposium Series.